There is a skinny cabinet in our kitchen between the dishwasher and the refrigerator. 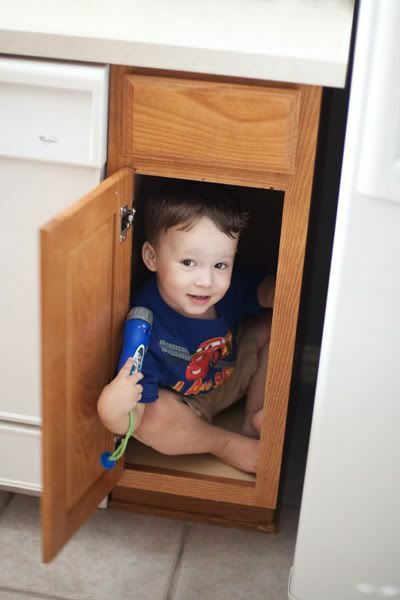 It is the only completely vacant cabinet in our entire kitchen and Ethan has taken up residence there. He calls it his "knock, knock door." I do not know where that came from, but that is what he calls it. He keeps toys, snacks, and water in there sometimes and he likes to climb in and out. He tells me to shut the door so he can pop out and surprise me. One day (very soon, I think ) he will outgrow this cabinet and I think we will both be sad about it. I love this kid!